Here’s a few pictures of some recent Delta PLC Software bench testing that we carried out for a machine builder on a Delta DVP-12SA2 PLC and Delta DOP-B HMI from Delta Electronics inc. We also setup and tested the Delta DVP-16SP (Digital) and DVP-04PT (PT100) I/O extension modules. These units are now with our customers ready for us to assist with the commissioning on site as part of their machine trials. The customer who is a major machine builder, manufacturer and supplier to the food and drink industry approached Acquire Control to help with their latest machine. We were able to demonstrate our ability of working with a wide variety of different PLC / HMI types and were delighted to be awarded the project to design the required Delta PLC Software. We carried out the initial Delta PLC Programming and HMI Software design and naturally look forward to getting the machine up and running in the coming weeks once the machine fabrication and build has been completed. 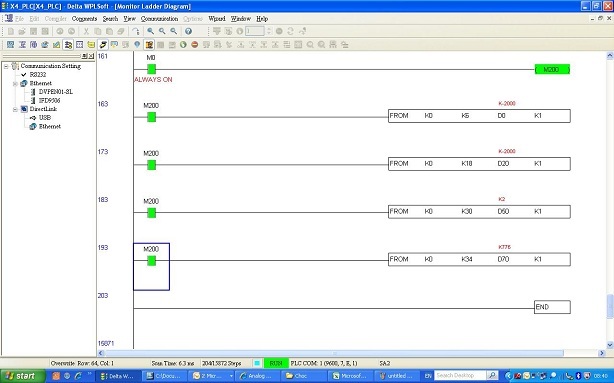 It’s the first time that we’ve used these particular PLC and HMI types by Delta Electronics inc and worked with Delta PLC Software, but we feel that one of our greatest strengths is that we are more than happy to work with, and design software for, new PLCs and HMIs as and when the need arises – it’s how we keep nimble as a company! Also we much prefer to have the flexibility of supporting numerous PLC/HMI types rather than being solely Siemens or Allen-Bradley PLC specialists for example, and it’s this philosophy that we feel lends itself particularly well to machine builders and manufacturers whose requirements are often cost critical or hardware specific – hence why we have a good relationships with, and continue to help several machine builders! 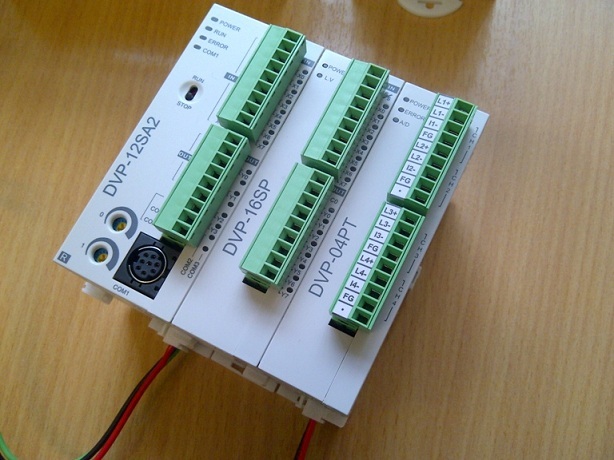 We have so far been impressed from what we have seen of the Delta DVP-12SA2 PLC and Delta DOP-B HMI, despite originally testing a DVP-EH Series (also shown above with the separate I/O extension block connected), as this model did not have the I/O capability to connect with PT-100 temperature sensors. Delta Electronics inc are a Taiwanese company who have representation/distributors at various points across the globe and provide a range of products including PLCs (Programmable Logic controllers), HMIs (Human Machine Interfaces), Delta C2000 Series Inverters (High Performance Vector AC Motor Drives) and Delta VFD-E Series Inverters (High Performance, Flexible Extension, Micro Type AC Drives). Although some of their hardware looks really familiar (Delta DVP-EH – Mitsubishi FX PLC anyone?) it does appear to be keenly priced. Also the PLC Software which we used is called Delta WPLSoft V2.20.11 and this also has a familiar look and feel to it, again we feel similarities could be drawn against Mitsubishi GX Developer (I have enclosed some screen shots above of this). However this friendly look and feel is really useful when you’re finding your way around the Delta DVP-12SA2 PLC for the first time and naturally allows for faster software development! 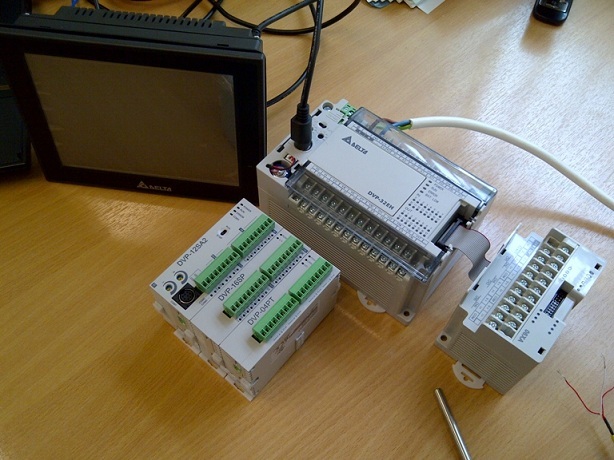 Please remember to let us know if you’re a machine builder who also requires help or advice on selecting the right PLC and HMI combination for your specific control requirements. As completely independent suppliers of PLCs, HMIs and Control Panels we genuinely feel that we’re best placed to help and advise on your particular requirements, whatever they may be. 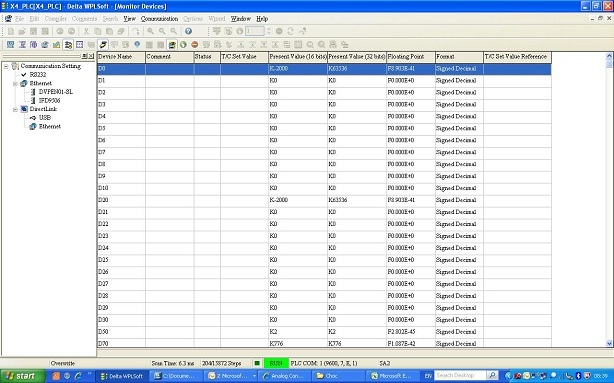 We’ll also be happy to help with any Delta PLC Software requirements that you have. Thanks!